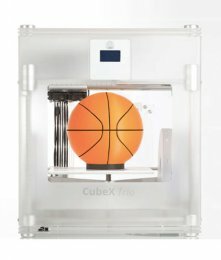 Produced by 3D Systems, the CubeX is a faster and bigger version of the Cube 3D printer. It's capable of three-color prints and creates objects up to 1,070 cubic inches (as big as a basketball). The CubeX can use either PLA or ABS plastic, features a touchscreen interface and costs around $2,499.